Ingress protection testing (or IP testing) is performed on equipment enclosures to verify they provide adequate protection against the environment they are used within. 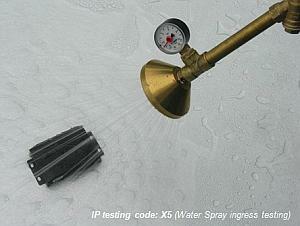 IP testing includes ingress of solid objects (probe), ingress of water (spray or submersion) and ingress of dust. 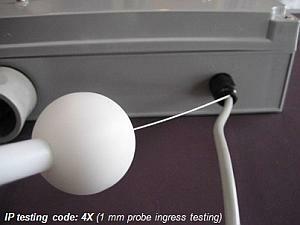 IP testing measurements are performed according to the procedures detailed in AS 60529, EN 60529 & IEC 60529, (equivalent requirements). 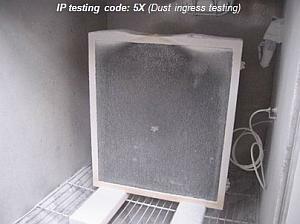 The ingress protection code or IP testing code signifies the rating for the protection of the enclosure using the letters “IP” followed by two digits e.g. “IP54”, “IP65”, etc. The first number of the IP testing code indicates the degree of protection against contact with moving parts and the degree that the equipment is protected against solid foreign bodies intruding into an enclosure. Compliance Engineering has been accredited by A2LA to perform IP testing to the requirements detailed in AS 60529, EN 60529 & IEC 60529. A2LA and NATA (National Association of Testing Authorities) are both signatories to the ILAC MRA and testing from each organisation are mutually recognised.